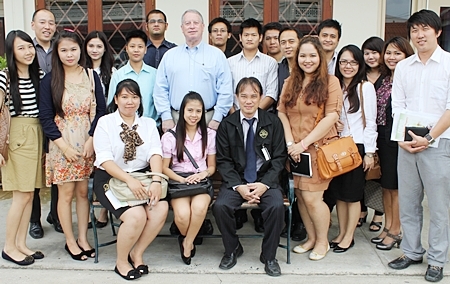 Graduate students from Payap University’s Faculty of Law met at the U.S. Consulate on August 10, 2012 to join an “Intellectual Property Rights Law” roundtable with Peter N. Fowler, Regional Intellectual Property Attaché for Southeast Asia, U.S. Foreign Commercial Service and United States Patent and Trademark Office. Photo courtesy of the U.S. Consulate General Chiang Mai. 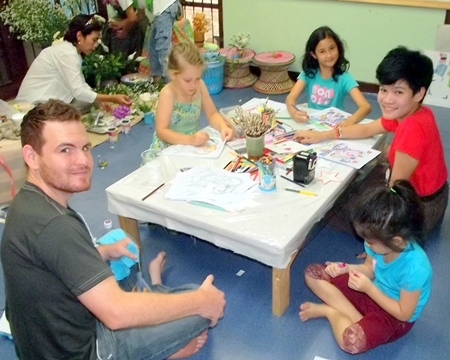 The Chiang Mai Municipality opened a new Day Care Center for young children at Suksawat in Mae Hia recently. Chiang Mai Mayor Tussanai Buranupakorn joined monks to offer blessings for the new buildings on August 9, 2012. (Photo courtesy of Chiang Mai Municipality). Chiang Mai University’s Language Institute is now offering courses in Bahasa Indonesia, the language used by millions of people in Indonesia. The courses will be taught by Indonesian native speakers and is being offered with the support of the Indonesian Ambassador to Thailand. Chedchan Sathuwong, Public Relation of Language Institute CMU, said the Institute’s new courses will be a boon for those wishing to work with tourists. The TAT noted that the nus of Indonesian tourists is expected to grow by 15-20 percent over the next few years. The classes are free of charge and offered Monday Tuesday and Thursday from August 20- October 2,2012 at 5.30 pm. For more details and sign up today at the Institute in Tel 0-5394-3751-3 and contact by email at [email protected] email and website www.li.cmu.ac.th www.facebook.com/.language.institute.cmu.